The solar cell efficiency horse race is in full swing and it seems like every other week a new record-breaking announcement comes out, but let’s take a step back and consider how efficiency is just one element in the installed cost of solar power. Another key factor is the cost of manufacturing, as demonstrated by a newly published paper on thin film solar cell technology from a research team at Empa, the Swiss Federal Laboratories for Materials Science and Technology. The paper, titled “Potassium-induced surface modification of Cu(In,Ga)Se2 thin films for high-efficiency solar cells,” was published on November 3 in the journal Nature Materials. Cu(In,Ga)Se2 refers to the semiconductor CIGS, a flexible compound of copper-indium-gallium-(di)selenide. As far as thin film solar cell materials go, CIGS has been the focus of attention because of its relatively impressive conversion efficiency. New CIGS thing film solar cell courtesy of Empa. That still leaves CIGS behind silicon in the efficiency race, but as the name suggests, CIGS thin film solar cells can be manufactured using an inexpensive roll-to-roll process that has long been used in food packaging and other industries, providing a potential cost advantage over conventional silicon solar cells. Due to their light weight and flexibility, thin film solar cells also lend themselves to a broader range of applications than conventional silicon solar cells (here and here for example). Though the title of the Empa CIGS paper is a mouthful, the basic concept is simple. 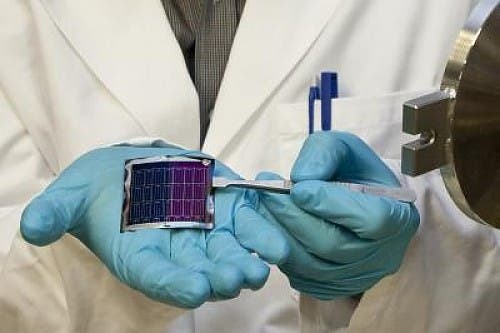 It involves the creation of a new way of assembling a thin film solar cell “sandwich.” The result is a two-for-one: manufacturing costs are potentially lower using the new “recipe,” while the team found that its conversion efficiency had improved over previous efforts. One key difference is in the choice of the substrate. To achieve a high “champion device” efficiency level in the lab, the typical thin film fabrication process involves depositing a layer of CIGS on a substrate of soda lime glass, which naturally introduces performance-boosting alkaline metals into the CIGS layer. One of the downsides of this technique is that the soda lime substrate involves a high-temperature fabrication process. As far as lab work goes that’s not a particularly large obstacle, but to leap the “valley of death” from the lab to the mass market a less energy intensive process would be more commercially viable. The Empa research team explored the use of a different substrate, a type of plastic film called polyimide. In terms of solar conversion efficiency polyimide has a number of disadvantages compared to soda lime glass. For one thing, it does not introduce performance boosters into the material. However, it has the potential to yield a less expensive manufacturing process. The team compensated for the polyimide film’s shortcomings by introducing the alkaline metals sodium and potassium fluoride after the deposition of the CIGS layer. They found that the two metals favorably altered the chemical composition of the CIGS layer, while also reducing the degree of optical loss caused by a buffer layer of CdS (cadmium-sulfur). The result was a performance level of 20.4 percent, an impressive improvement over the 18.7 percent level announced by the same team less than three years ago. The team was also able to pinpoint the critical role of added potassium in boosting efficiency, which could lead to future improvements in the manufacturing process. By the way if Empa rang some of your bells, you might be thinking of another team at the institution which is working on thin film solar cells based on cadmium telluride (CdTe). That team recently announced an efficiency of 11.5 percent, which sounds kind of lame except when you consider that CdTe solar cells offer a number of cost advantages. That team also has its sights set on the 15 percent efficiency range, with the possibility of closing in on the 20 percent range. While it’s natural to get caught up in the thrill of record setting solar cell efficiency improvements, the bottom line comes down to the installed cost of solar power, and that involves a variety of somewhat less exciting but no less critical factors. For the record, the Obama Administration has targeted these key areas through the SunShot solar power initiative. The overall goal of Sunshot is to bring the cost of solar power down to parity with fossil fuels. To that end, the Department of Energy has been funding programs that bring down manufacturing costs and “soft costs” (permitting, installing, inspecting, etc.) as well as improving solar cell efficiency. Concurrently, the Department of Defense has been funding numerous projects to improve solar cell efficiency.